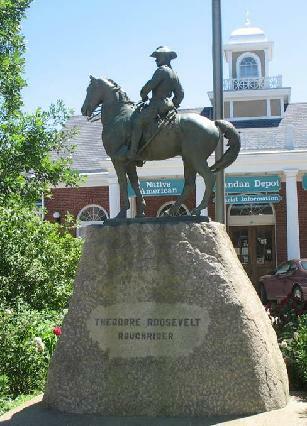 "Theodore Roosevelt Roughrider" portrays North Dakota's most famous adopted son as colonel of the regiment he commanded in the Spanish-American War. The sculptor, Alexander Phimister Proctor, was born in Canada and raised in Colorado. Alexander Proctor was a contemporary of Frederic Remington and Charles Russell. He dedicated his life to creating monumental statues throughout the United States. His other equestrian works include statues of General William T. Sherman in New York's Central Park and General Robert E. Lee in Dallas plus Denver's infamous "Bronco Buster." Proctor's original tribute to Roosevelt is erected in Portland Oregon and was the subject of the Metropolitan Museum of Art's first educational film on the work of a sculptor. Alexander Proctor had met Theodore Roosevelt at the 1893 World's Fair. Roosevelt commissioned Proctor to make several sculptures for the White House during his presidency. According to the Inventory of American Sculpture (IAS), the Mandan sculpture is a smaller version of the one commissioned by Dr. Henry Waldo Coe for the City of Portland. Proctor remarked about his intention: "I wanted to give the world... the impression of Roosevelt as I knew him --- as, indeed, I always think of him. I most admired his fearlessness, his courage, and the energy always waiting to spring into action. I never thought of him as a man of hasty, ill-considered action. All his exuberance, all his restlessness, was only the surface that covered a quiet dignity and reserve. The popular idea of him is that he never was in repose. I wanted to show him as he appeared to me, with all his magnificent energy held in check." Coe met Theodore Roosevelt while living in Dakota Territory, and the two formed a long-lasting friendship. Dr. Coe was Mandan's first elected mayor and represented the city's residents in the last territorial legislature in 1885. He and his wife relocated to Portland in 1891. While he commissioned the original statue for Portland, he later presented this smaller version to the City of Mandan. The statue was designed with the approval of the Roosevelt family. Edith and Kermit Roosevelt found the uniform TR wore at San Juan Hill rummaging through family trunks. They furnished it to Proctor to use in casting the statue. 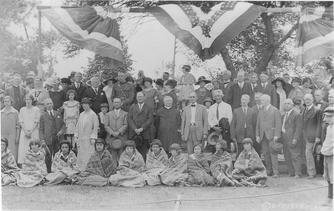 Roosevelt's widow Edith and all five of his surviving children and spouses attended the dedication. 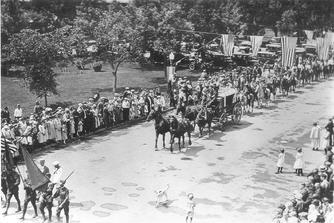 After the unveiling of the bronze statue in Mandan, the Mandan Daily Pioneer newspaper reported of the crowd attending the ceremony, "Hundreds of cowboys, a half thousand Indians, intermingled with the six hundred Legionnaires were for the state convention, school children, old timers of the early days, staid business in fantastic roundup shirts and holiday sombreros and a large number of service men in uniform.” A message was also read from President Coolidge. A full-scale replica of the statute was cast in 1923 in bronze on California light grey Raymond granite pedestal by the Henry Bonnard Foundry, New York and is on display in Minot. During his lifetime, Dr. Coe refused requests for the statue to be copied and for Philadelphia's Fairmont Park and New York's Central Park. The 12" cast from the original statue was kept for over 7 decades in the State Historical Society of ND archives but was transferred in 2007 to the new Proctor Museum in Wyoming. 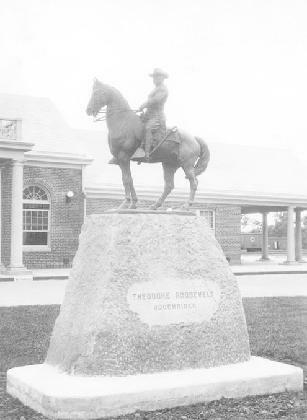 The statue was dedicated on July 2, 1924 and originally installed along Main Street in the center of the eastside depot park. 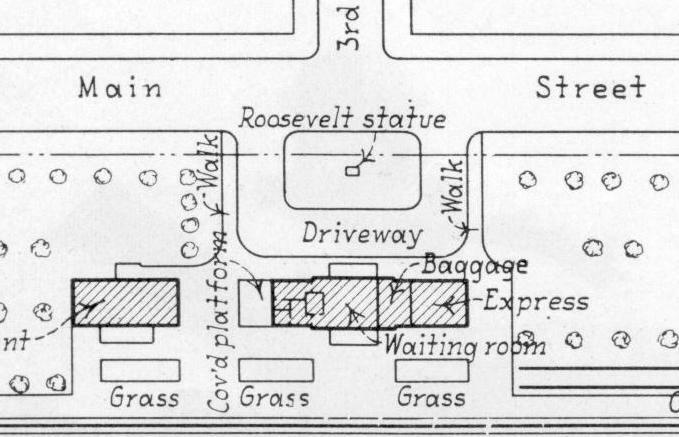 It was moved to its current location centered on the intersection of Main Street and Third Avenue in 1930 in conjunction with the construction of the current depot in 1930 . The wooden flag pole from Fort Abraham Lincoln was also moved to the NP Railroad Depot ellipse. But its condition eventually deteriorated and it was replaced with the metal flagpole in place today. Theodore Roosevelt served for a short term as a Morton County deputy sheriff. Sheriff George Harmon authorized Roosevelt to track down the three men TR accused of stealing his 16 foot long boat. The three were eventually subdued by Roosevelt with no fight and brought to trial in Mandan. One was set free and the other two received five year prison terms in the Bismarck penitentiary. The boat was stolen from Roosevelt's Elkhorn ranch in a very wintery April 1886 in was then in Morton County (now in Billings County) north of Medora. Being too cold after capturing the thieves, Roosevelt did not tie their hands or feet. He borrowed a wagon, walking guard behind them for the period of 36 hours without sleep until first stopping in Dickinson.